Rabbits have a number of parasites that are specific to them and that can impact rabbit survival through direct mortality, or by impacting on physical condition or potentially exacerbating the impacts of other rabbit diseases such as myxomatosis or rabbit haemorrhagic disease. Eimeria intestinalis and E. flavescens are the two most pathogenic rabbit coccidia, which are rabbit intestinal parasites. This project aims to confirm the visual (microscope) identification of Eimeria intestinalis and E. flavescens at Wellstead in south-west Western Australia in 1998, and their published absence at locations in south and eastern Australian in the 1960s. This is Stage 1 of a project to assess the potential for Eimeria intestinalis and E. flavescens to be translocated to locations where they are absent with the aim of providing additional control of wild rabbit populations and their severe impacts. To confirm presence of Eimeria intestinalis and E. flavescens, at Wellstead in south-west Western Australia and absence at sites in south and eastern Australia. 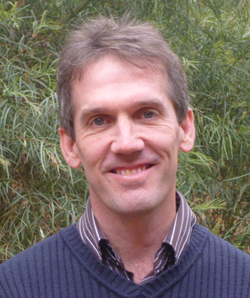 An ecologist and author of a number of published journal articles, reports and book chapters, David holds the position of Research Officer with the Natural Resources Management Biosecurity Unit of the Department of Primary Industries and Regions South Australia (PIRSA). David primarily undertakes research on rabbits focussing on improving their control by the RHDV and myxomatosis biocontrols through an ongoing 21 year project at Turretfield in SA. He has also surveyed invading cane toads in SW Qld, mapped rabbit warrens for destruction, undertaken landscape fox control, planned and assisted in the reintroduction of the western quoll (Dasyurus geoffroii) to SA, surveyed landholders about feral deer and helped address numerous other pest animal issues. David has fulfilled a diverse range of roles throughout his career including Technical Officer, National Park Ranger and Research Fellow. He completed a Bachelor of Applied Science (Wildlife and Park Management), followed by a Diploma in Natural Resources in 1990, and a PhD in 2003 focusing on “The search for a novel toxicant in Gastrolobium (Fabaceae: Mirbelieau) seed historically associated with toxic native fauna”. An outcome from this PhD research is a current collaborative project to develop a toxic ‘population protecting implant’ to remove predating feral cats and stop them wiping out reintroduced or vulnerable native fauna populations. plus other providers of interstate samples.